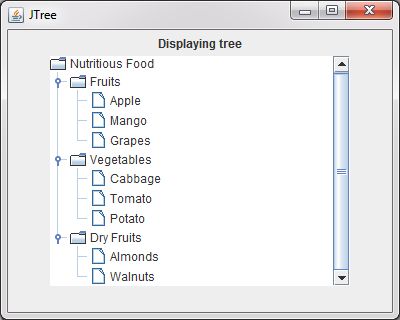 JTree class is used to create a hierarchical view of data, with one top main root node, its sub-root nodes and their children nodes. The user can expand or collapse the top main root node and its sub-root nodes. When a node is selected from the JTree, a TreeSelectionEvent is generated, which is handled by implementing TreeSelectionListener interface. JTree is another lightweight component which extends JComponent class. public JTable() Creates a JTree with a sample model. public JTree(TreeModel newModel) Creates a JTree using TreeModel. public JTree(TreeNode root) Creates a JTree with the specified TreeNode as its root. public TreeModel getModel() Gets the TreeModel whose data is displayed by JTree. public int getRowCount() Gets the total number of the rows in the JTree. public void addTreeSelectionListener(TreeSelectionListener tsl) Adds a listener for TreeSelectionEvents with JTree. //Creating 3 children of the root node, Nutritious Food. //Creating a JTree from DefaultTreeModel, implementer of TreeModel Interface. scrollP.setBorder(BorderFactory.createEmptyBorder()); //How to remove the border of JScrollPane. 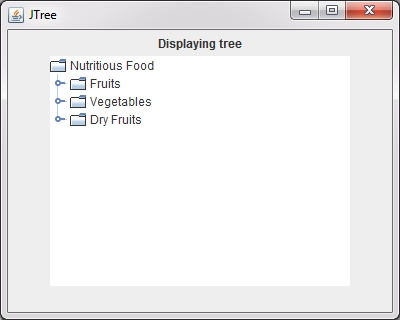 When you run the code, you are presented a window that shows a tree structure with the root Nutritious Food and its children node and their children nodes. When you click on the each of these children node, you are shown its children nodes, depicting our constructed JTree. In the next code, we are going to handle the events occurring when a particular cell of JTable is selected or when it's value is changed, to handle such events, we will implement TableModelListener interface and will provide implementation of its method tablechanged(). //Creating 3 children of the root node, My Computer. //Adding two child of D Drive to D Drive. //Creating and adding one child of E Drive. //Registering A class to listen to JTree events. 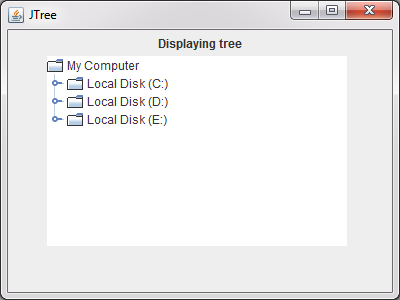 When you run the code, you are presented a window that shows a tree structure with the root My Computer and its children drives. 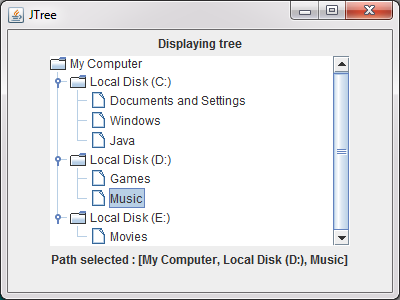 When you click on the each of these children drives, you are shown its contents and at the bottom of the JTree, you are also shown the path to this selected content.